Make your child’s birthday fun and exciting! Jungle Jill will bring the party to you! 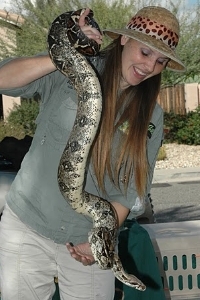 Live, exotic and domestic animals up close and interactive for an unforgettable experience! available animals, and what’s new with Jungle Jill. Please use the buttons at the top of the page to navigate and call today for more information or to set up your Animal Encounter! "What is an Animal Encounter?" Jungle Jill's Animal Encounters featured on Ch. 12 Arizona Midday. 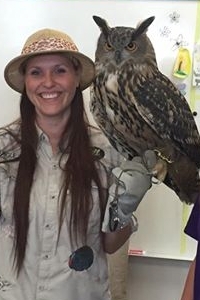 ​Jungle Jill's Animal Encounters was founded in 2006 as a way to educate, inform and entertain audiences. 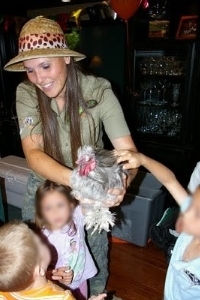 Jungle Jill brings live, exotic and domestic animals to you, up close and interactive for an unforgettable experience! 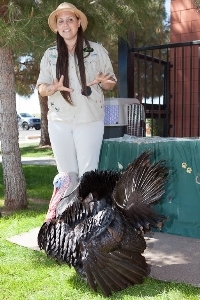 Your kids will get a special opportunity to see and touch LIVE animals up close while learning at the same time! ​People of all ages enjoy the enthusiasm that Jungle Jill brings to each presentation. Make your child’s birthday party more fun and exciting! Jungle Jill will bring the entertainment to you. Each presentation is unique because you choose the animals you would like to see, and customize the program to meet your needs. 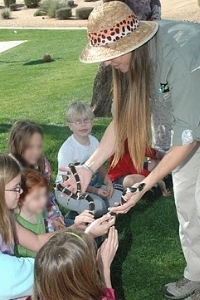 Animal Encounters are educational presentations based on one hour programs. A one hour program consists of 8-10 animals ranging from birds, to reptiles, and creepy crawlies (insects and invertebrates). You get to pick which animals you want on the guest list for your party! and what’s new with Jungle Jill.